It was a beautiful sunny day outside, the sun was also shining inside the gymnasium at Tecumseh Public School! 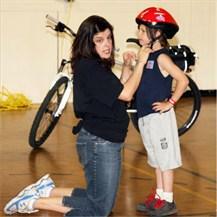 A group of 25 Grade 2 students were treated to a fun, interactive presentation about the importance of wearing bike helmets. Michelle Gregory-Brooks from ThinkFirst led the presentation which included educating the students on the functions of the brain and the importance of protecting it from injury by wearing a helmet. A soft, green, slimy jello brain was passed around so students could get an idea of how delicate our brains are, the brain was met with “ooh’s”,”ahh’s” and grimaces! 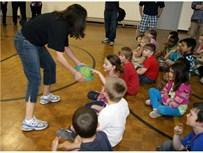 Another dramatic representation to drive home the message of the importance of wearing your helmet , was the melon drop. Michelle climbed a ladder where she then dropped a melon wearing a helmet off the top, the melon landed safe and sound! She then climbed the ladder with another melon who wasn’t wearing a helmet and dropped it off the top, and SPLAT!!!! The kids enjoyed the demonstration but also saw the damage that can happen to your skull and brain if you don’t wear your helmet. All of the students were then fitted with their own brand new bike helmet courtesy of three local law firms; Martin & Hillyer Associates, The Munn Law Firm and Brechin & Huffman. 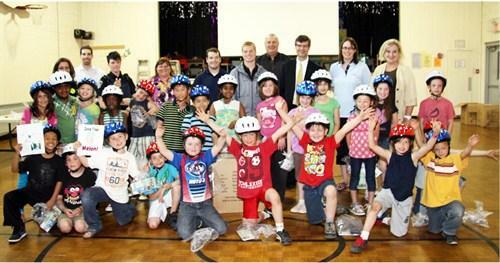 The law firms also donated helmets to the Grade 1 and 3 students. Laura Hillyer, of Martin & Hillyer Associates in Burlington, organized the event in association with OTLA (Ontario Trail Lawyers Assocation) and BIAPH (Brain Injury Association of Peel-Halton). We would like to thank Ward 4 City & Regional Councillor Jack Dennison for his participation in the event, Cst. Erin Toth of the Halton Regional Police for attending the event, Jorun Rucels of BIAPH, and Angela DeMaria, Public Health Nurse with Halton Region for their participation. Pictured above alongside the Grade 2 class and teachers from Tecumseh, from left to right: Angela DeMaria – Public Health Nurse with Halton Region, James Page – Lawyer at Martin & Hillyer Associates, Cst. Erin Toth – Halton Regional Police, Claire Wilkinson – Lawyer at Martin & Hillyer Associates, Bruce Hillyer – Lawyer at Martin & Hillyer Associates, Stephen Abraham – Lawyer at Martin & Hillyer Associates, Laura Hillyer – Lawyer at Martin & Hillyer Associates, Jorun Rucels – BIAPH.